Twin-tank vegetable oil systems have proven to be the most reliable method of running diesel engines on vegetable oil. BioTuning have very high quality kits which are based around our compact heat exchanger, heated filter and valves. In addition, we can customise our kits to your requirements so please do contact us should you require something a bit different. The idea is simple; diesel is used to run the vehicle until the engine is at operating temperature, the vehicle is then run on neat vegetable oil from a second tank until the end of the journey when the engine is flushed with diesel to prime it for the next cold start. Once the kit installed, the vehicle becomes a diesel/vegoil hybrid, able to run happily on either vegetable oil, diesel or blends of the two. BioTuning are the UK leaders in the supply of components for conversion of diesel vehicles to run on vegetable oil. We have been sourcing, designing and manufacturing components for this purpose for over 10 years. Our parts have been used to convert thousands of vehicles in the UK and overseas. Our business model is to provide the very best, most reliable components at the cheapest possible price with good quality customer care. Compare our parts with those of our competitors and you will see that ours are simply better designed and engineered - and since we design our parts and commission their manufacture from ISO accredited automotive factories there are no middle-men to bump up the prices. Some may sell cheaper kits but they are typically a box of hoses with one or two cheap change over valves and no heating components to speak of. Others may claim to offer the "highest quality kits on the market" but compare their list of components against the component list in our kits to see for yourself that this is simply not true. 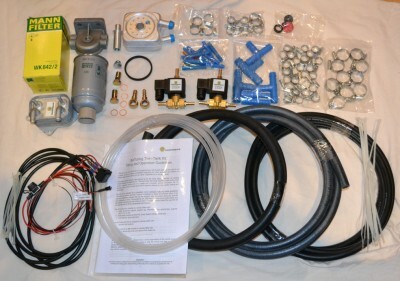 Our kits have everything you need to convert the typical vehicle to run on vegoil except the second tank. They can be installed in one to two days by any competent DIYer by following our supplied installation guides. Our BioTuning - version 2 kits are based around the use of a pair of solenoid fuel tank selector valves to simply select whether the vehicle is run on vegetable oil or diesel fuel. They contain everything that is required to convert indirect injection and direct injection diesel vehicles with Bosch VE and VP pumps or equivalent. The second tank is not supplied with our kits since this is not considered (by us) to be a standard 'one-size-fits-all' part. The kits are not directly suitable for vehicles fitted with CAV pumps, Pumpe Duse or common rail engines without specifically being extended to work with those more fragile or more demanding vehicles. Our basic kit is suitable for small engined cars. For larger vehicles such as pickups, 4x4s and vans there are standard upgrade options for the valves and the heat exchanger. In addition, we can make alterations to the kits listed to suit your requirements. For example, if converting a vehicle with a heated filter already we can provide a standard diesel filter or none at all. Please email with any enquiries relating to customising a twin tank kit. While every effort is taken to ensure that the information on this site is accurate we accept no responsibility or liability for any problems encountered while acting upon it.